Indian prime minister Narendra Modi faced his toughest year on the economic front in 2017. The BBC's Sameer Hashmi looks back at the year's key economic moments to predict what 2018 might look like. Only a year ago it seemed like India was on track to become an important engine of growth for the global economy. It was the fastest growing economy in the world in 2016, surpassing even China, which had been witnessing a slowdown. India was hailed as a bright spot in an otherwise gloomy global economy. But the narrative changed in 2017 as India's economy turned sluggish. Between January and December 2016, it grew by more than 7% in every quarter compared to the same period the previous year. During one quarter it even touched 7.9%. But in one quarter (April-June 2017), it fell to 5.7% - its lowest growth in three years. Two major decisions on economic policy had a severe impact on 2017. First was the sudden cancellation of nearly 86% of the cash in circulation in November 2016 - the effect lasted until 2017. Second were the glitches in the rollout of the biggest tax overhaul since independence - a single Goods and Services Tax (GST) replaced the numerous federal and state taxes in June 2017. But 2017 didn't bring only bad news for Mr Modi's Bharatiya Janata Party-led government, which swept to power in 2014. There were some major achievements as well, including India's 30-point jump to join the top 100 countries in the World Bank's "ease of doing business" index. Then the global credit rating agency Moody's upgraded India's sovereign credit rating for the first time since 2004. India's stock markets were among the world's best performing - they grew by more than 30% year on year. India's federal government also announced a $32bn (£23.7bn) bailout plan for India's public sector banks, which have been struggling due to mounting bad loans, or non-performing assets as they are known. But overall, it was a tough year and there are still many challenges that Mr Modi faces in 2018. Accelerating economic growth will be the federal government's main objective in 2018. While most analysts expect the recovery to be slow, there is also a consensus that it will be a better year than 2017. "There will be recovery because the shocks due to the cash ban [the Indian rupee ban in 2016] and the GST will naturally fade," says Sajjid Chinoy, chief Asia economist at JP Morgan. To streamline the implementation of the GST, the governments announced several changes in the last few months. It also revised GST rates for 178 goods and services after it was criticised for keeping tariffs high. 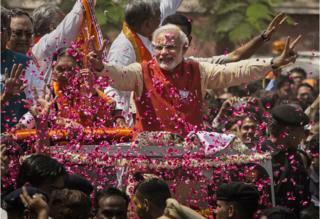 Is Narendra Modi losing his mojo? What ails the Indian economy? Why are farmers in India protesting with mice and human skulls? "2017 was a year of transition for the economy with GST coming in. These foundations were necessary for a more sustainable growth over the next few years," says Madan Sabnavis, chief economist at CARE Ratings, an Indian ratings agency. The International Monetary Fund estimates that India's economy will grow by 7.4% in the next financial year (April 2018 - March 2017). It had earlier pegged the growth rate at 7.7%. Even though economic growth prospects next year are looking brighter, the biggest obstacle for the government has been job creation. India is the world's second most populous country and it needs to create 12 million jobs every year to absorb its young workforce. But small businesses were still reeling from the rupee ban in November 2016 when they were again hit hard by the rollout of GST. Many of them closed down, leading to millions of people, especially in the unorganised sector, losing jobs. Agriculture, construction and small enterprise are the biggest employers in India because they are labour-intensive businesses. But all three sectors have been struggling to generate jobs in recent years. Job creation is a prominent red mark on Mr Modi's economic track record. While most experts agree that this is a long-term problem for the economy, they expect the government to take steps in 2018 with an eye on the parliamentary elections scheduled for 2019. "We can expect the government to provide some impetus to small businesses and sectors like agriculture and construction that will lead to some employment generation," says Mr Chinoy. Rising crude prices and low levels of private investment are other big challenges, according to Mayuresh Joshi, vice-president of Angel Broking, a Mumbai-based brokerage firm. He says that rising crude prices will affect government finances and also lead to higher inflation, which has consistently remained under the central bank's target - 4% - over the last year. India imports more than 70% of its oil to meet domestic demand. With global crude prices going up, the government has two options - it can either increase retail prices or pay the difference. "With elections just over a year away, the government might be reluctant to pass on the full price increase to consumers. It will be an unpopular move," says Mr Sabnavis. The year 2017 was marked by several farmers protests across the country. The agriculture sector has been struggling with farm incomes dwindling due to unsteady growth over the last few years. More than half of India's population relies on agriculture for income. Millions of farmers have not been able to pay back loans leading to more distress. Some states, such as Uttar Pradesh in the north and Maharashtra in the west, have announced loan waiver schemes for farmers but there have been issues related to implementation. "There's not much the Modi government can really do because agriculture is a state subject and it needs to be addressed by the respective state governments, but it does create a perception problem for the [federal] government," says Mr Sabnavis. Eight Indian states will be holding local elections in 2018 - out of which four have a huge rural population. The Bharatiya Janata Party is in power in three of those states and so experts believe that if the BJP-led federal government does not resolve the agricultural crisis, then it could hurt their chances at the ballot. Since coming to power, Mr Modi is credited for implementing critical economic reforms. But with economic growth sliding in 2017 and Indian elections due in 2019, people expect him to be cautious in the year ahead and steer clear of major reforms. "The government needs to consolidate all the reforms that have been brought in over the last 40 months. It needs to make sure that they are implemented properly. There is no need for further reforms," says Mr Joshi. The government is expected to increase expenditure on social welfare schemes focused on rural India. For Mr Modi, 2018 will be a decisive year. His government's handling of the economy will certainly impact his electoral prospects in 2019.